1. That Egypt is in a state of economic emergency. 2. That the government will launch a national economic reconstruction program tantamount to a postwar reconstruction plan, a program which will be binding on every future government according to the new constitution. 3. The government outlines specific medium- and long-term national infrastructure, energy, water, agriculture, and industrial plans. 4. The government declares all previous agreements with the International Monetary Fund (IMF) to be null and void, and freezes all free-trade agreements with the EU, and replaces them with bilateral economic cooperation and trade agreements with European nations individually. 5. A sovereign credit system to be established domestically to support a “National Reconstruction and Development Bank,” to finance the necessary development projects. Foreign nations are invited to subscribe to the new national credit mechanism, either by direct deposits or by extending guarantees, including export guarantees to corporations that will provide technologies and know-how to the Egyptian reconstruction program. These points have to be announced by the President, in a televised address to the nation, for a “Declaration of Economic Independence,” to seek the approval of the people of Egypt. Following such approval, a national convention is to be held in which these matters will be discussed in more detail by Egyptian scientists, engineers, industrialists, and economists, in addition to public figures. The convention will be held under the auspices of the different ministries of the interim government. Egypt has been, since 1882, one of the main targets of the British Empire, first for looting, and later, for control and destruction, when the Egyptian people’s character and patriotic nature rejected British imperialism. Since that time, and throughout World War I, World War II, and the Cold War era, Egypt has been the backbone of the Arab nations. If it goes, everyone else goes. If it survives, a better future for the Arab nations and those in Southwest Asia and North Africa is possible. The key three sectors of infrastructure, without which, neither agriculture, nor industry could develop are: energy, water, and transportation. 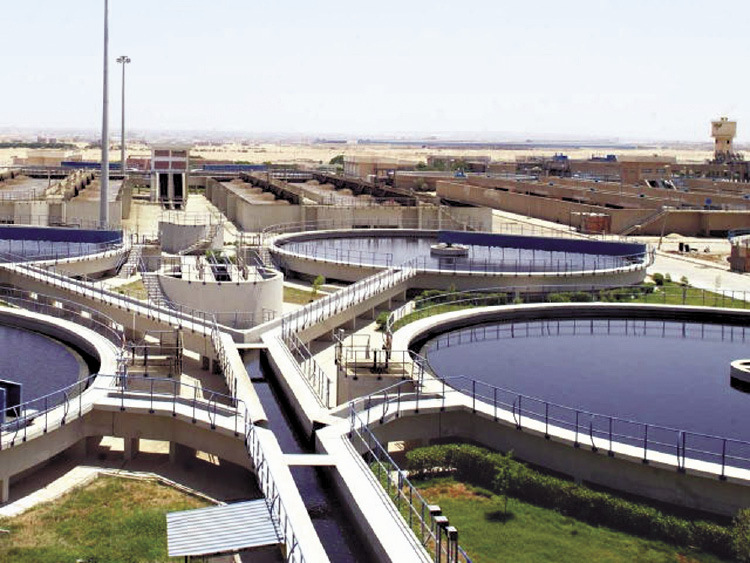 Shown: the El-Sheikh Zayed water-treatment plant, Sheikh Zayed City, Egypt. While observers are puzzled by the recent events in Egypt, and whether there was a military coup or not, or why the Britain’s ally, the Saudi Royal Family, suddenly shifted their position to help overthrow the Muslim Brotherhood government of Mohammed Morsi, the only significant issue to keep in mind is that the British Empire’s intention to destroy Egypt is still on the agenda. The British do not care who is in power. What is important for the Empire is the policy of looting and destroying Egypt, which in the past 40 years, has been characterized by economic destruction through the IMF policies, which are backed by the recent U.S. administrations, and by Europe. That Qatar and Saudi Arabia are suddenly on opposite front lines in Egypt (while still united in the destruction of Syria through their support for the British-deployed al-Qaeda jihadists) means nothing in the eyes of history, since both the Saudis and Qataris are puppets of the same British Empire. Anti-Islamist liberals of Egypt, who were mostly educated in British economic schools, are equally as dangerous to Egypt as a nation, as are the jihadists and Salafists. For the empire, it does not matter if the cat is black or white. What matters is that it adds dead mice to its account. While providing bread to the people is necessary, this is not the only purpose of government. Instead of launching a massive reconstruction program, and breaking all ties with the IMF and its policies, Morsi’s government emphatically spent the next six months begging (“negotiating with”) the IMF to return to Egypt, and to extend a humiliating $4 billion loan. Adding insult to injury, the IMF refused. Not only did Mr. Morsi completely misread the internal situation in his country, and in the U.S. Administration he was hoping would support him, but he also failed to realize how bankrupt the IMF, and behind it the EU and the USA, are, economically and financially. The misguided Morsi government and the economists who supported it tried to explain that the sum of the IMF loan was not the issue, but that the IMF loan would have become a “certificate” of good behavior for Egypt, allowing it to indulge in borrowing money from international financial institutions. This would have further enslaved Egypt with more debt. The problem of the Morsi government, in addition to its hunger for power, and as a political pawn for Anglo-American geopolitics—in its role as part of the international Muslim Brotherhood organization—was not lack of money but its lack of vision and knowledge of true economics, physical economy. Now, what is to be feared, is that the new interim government of Egypt, appointed by the Supreme Council of the Armed Forces on July 4, will resort to the same temporary measures and solutions to keep the status quo, leaving even greater burdens to the coming government, which is supposed to be elected three to four months from now, if political stability is preserved in the country! 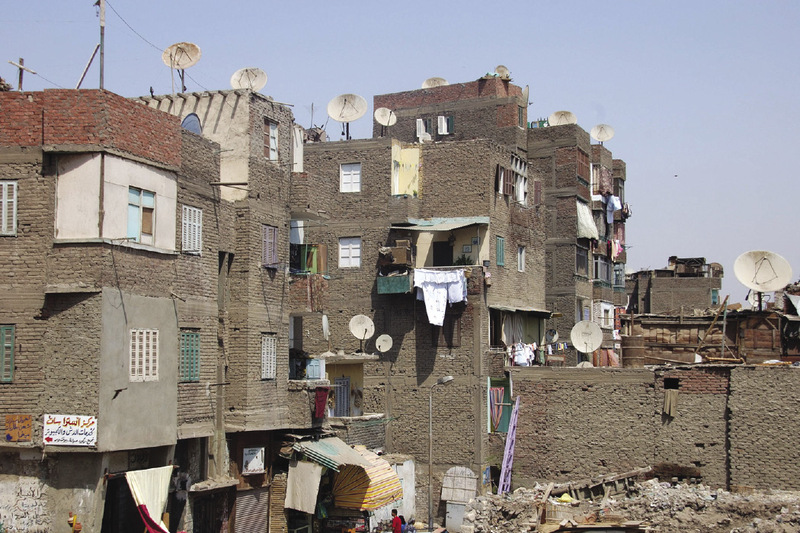 Egypt must break with IMF-World Bank policies, which have destroyed its economy, and impoverished its people (as seen in this Cairo slum), and undertake an emergency mobilization to build great projects funded by sovereign national credit. Now, for any government, whether in Africa or even Europe, to stay within the limits of its budget, leaves no space for any investments in public utilities, or any meaningful large-scale projects to put the masses of unemployed people to productive work and increase the productivity of the economy as a whole. This becomes even impossible in light of the fact that the Egyptian government deficit has been increasing at a rapid rate, especially since April 2011. The Egyptian Finance Ministry announced in March this year that the total budget deficit reached 10.6% of the country’s gross domestic product (GDP) in the first ten months of the 2012-13 fiscal year. The deficit reached US$26.5 billion, compared with $16.8 billion in the period from July to April of the 2011-12 fiscal year. This deficit was expected to reach 11.5% of GDP by June. In 2012, budget revenues were at US$50 billion, and expenditures were $77 billion. Egypt has been borrowing in the international financial markets to finance its budget deficit, and has been receiving preferential loans and aid from Qatar, the main supporter of the Muslim Brotherhood in Egypt and the region. Qatar has extended US$8 billion so far to the MB government. Following the overthrow of Morsi, Saudi Arabia, the United Arab Emirates, and Kuwait pledged US$8 billion in loans and grants to the new government. But everything has a price, and these generous offers will tie Egypt to the process of forever chasing handouts to fill the deficit. Qatar, on the other hand, was looking for booty in Egypt to loot in return for its loans, as was the case with its attempt to lease the Suez Canal Corporation, an operation which was stopped after massive popular protests. Another attempt by Qatar’s “sovereign wealth fund” QInvest was to take over a 60% stake (worth US$250 million) in the largest Egyptian investment bank, EFG Hermes. The deal, which was rejected by Egyptian financial regulators in May 2013, was brokered by none other than JPMorgan Chase, which advised EFG Hermes and Goldman Sachs, which were advising Qinvest. EFG Hermes is typical of the corrupt financial institutions that are completely integrated with the Anglo-American speculative financial empire, and which were participating in the IMF-directed privatization of Egypt’s state-owned enterprises and assets in the era of President Mubarak. The deal was deemed by Egyptians to be politically infected, as two of EFG’s chief executives, Hassan Heikal and Yasser El Mallawany, are on trial, along with the two sons of the ousted Mubarak, upon charges of illegal share dealings in 2007 transactions. More than a dozen domestic and international investment banks are active in Egypt, draining a significant amount of Egypt’s private capital into the global financial bubble. The true wealth of Egypt is its people, the millions of well-educated youth, its natural resources, its strategic location, its history and national character. 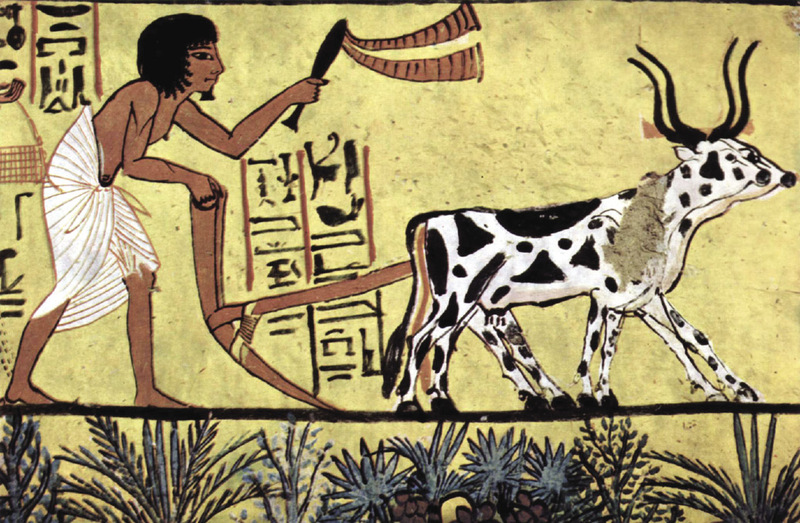 Here, a 5,000-year-old wall painting representing agriculture, from the Grave Chamber, in one of the Great Pyramids. Although the current President and government are interim, emergency institutions, they nevertheless have the possibility and responsibility vested in them through the massive public manifestations in the recent uprising, to declare the intention of the government and the nation of Egypt in terms of its future economic policy. First, the fallacy of the current belief in money as the most urgently needed element for Egypt’s economic recovery has to be dealt with. A related problem is the belief in “foreign investors” as a magic cure for most problems. It is therefore urgent for Egyptian government officials and economists to study the historic background provided by LaRouchePAC on Alexander Hamilton’s methods to get a deeply indebted United States, which had just exited a Revolutionary War against the British Empire, to stand on its feet, by creating a truly sovereign credit system, whose purpose was to increase the productivity of society as a whole, through focusing the nation’s own credit and financial resources on necessary “internal improvements” of infrastructure development, science, and technology. • That the President declare publicly the intention of the Egyptian government to rebuild the nation’s economy through a number of concrete and well-known projects, and direct all available resources and energies toward that goal. The government should seek the consent of the Egyptian people to achieve that goal, as if Egypt were embarking on a new war effort. The government should also declare that the nation finds itself in a state of economic emergency condition. a) Severing all formal ties with the IMF and the World Bank “temporarily,” and canceling policies imposed on Egypt by these institutions in previous years, such as structural adjustment, privatization of public enterprises, and liberalization of trade. Freezing these agreements, which made Egypt and other North African nations victim to unfair competition with Europe, will allow Egypt to impose tariffs and restrictions to protect its fragile agricultural sector, and to ensure a certain degree of food security, by dedicating the arable land and supporting the Egyptian farmers to produce the food that the nation requires. The emphasis on exporting of foodstuffs to acquire foreign currency, which was encouraged by the IMF policies, should be reduced. As an alternative to the Euro-Mediterranean agreements, Egypt would renegotiate bilateral trade and cooperation agreements with the European nations individually. c) Imposing currency exchange restrictions to protect the value of the Egyptian currency and prevent capital flight. In declaring that intention, the government of Egypt should clearly identify the weaknesses of the economy of the nation, and propose concrete remedies. For example, Egypt has been suffering from chronic shortages of food, fuels, electric power, housing, public transport, and unemployment, to name a few. While hundreds, and maybe thousands, of urban infrastructure-modernization projects have been awaiting implementation for as long as decades, in every city and town, it is through the mobilization of a national, top-down reconstruction effort that the nation’s resources could be mobilized. The key three sectors of infrastructure without which neither agriculture, nor industry could develop are: energy, water, and transportation. Energy: In the energy sector, Egypt’s long-neglected nuclear energy program, which was planned to be launched in the early 1980s, has to be revived. While Egypt’s nuclear ambitions go as far back as the 1950s, and President Eisenhower’s “Atoms for Peace” policies, it was in 1984 that the Egyptian Supreme Council for Energy decided to begin construction of three nuclear plants, starting with the Al-Dhabaa plant on Egypt’s northeastern Mediterranean coast. The plan was to produce both energy and desalinate seawater. But the intention to abandon nuclear power and technology in the West found a good excuse in the Chernobyl nuclear incident to block all discussions of new nuclear plants, especially, for developing nations. Egypt has had a problem finding partners in the West to build the reactors. In the current situation, only Russia, China, and probably South Korea, would be willing to discuss these issues with the Egyptian government, and these possibilities should immediately be explored. Relaunching of the nuclear program should be made a key element of the new governments declaration of intention. Egypt’s petroleum sector is ill-managed, and requires new investments. The refinery capacity is so low, that Egypt exports $9 billion worth of raw petroleum annually, but spends exactly as much on imports of refined petroleum products from industrialized nations. Egypt is in dire need of modernizing this sector and building refinery capacity to meet the massive shortages in automobile fuel and other petroleum products. Egypt should find ways of cooperating with the leading refinery and chemical plant builders in the U.S., Germany, and Japan to launch joint ventures to build such capacity in Egypt. Water: While Egypt has enjoyed the comfortable company of the Nile and its narrow valley for thousands of years, the time has come that the Egyptian people move into new areas of the country, out of necessity and for their advantage. The nearly 80 million Egyptians live on only 6-7% of the land area of their country. Creating new, urban, agro-industrial centers to the west of the Nile Valley has become an absolute necessity. That area is a fertile, mineral-rich region, but is not connected in any way to the national transport, water, and energy grid. Egyptian engineers and scientists have urged successive governments to implement scientifically viable and economically feasible projects for this purpose, to no avail. 1. The Development Corridor proposed by space scientist and Egyptian-American patriot Dr. Farouk El-Baz.4 The corridor of roads, rail, and canals is to run parallel to the Nile valley all the way from Aswan in the south to Alexandria in the north. 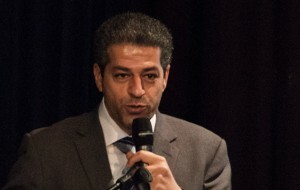 The details of the project have been described in previous reports in EIR and can be studied on Dr. El-Baz’s own website (http://faroukelbaz.com/). 2. The High Nile Pipe River project, proposed by Dr. Hamdy Saif El-Nasr, geologist and aqueduct engineer. This project is based on channeling water from the highest point of the Aswan Dam in southern Egypt, through large-diameter pipelines, along the mountain range that flanks the Nile Valley from east and west. A secondary pipeline system will bring the water down to the desert areas by the force of gravity, generating electric power. The project is supported by a large number of engineers. (The campaign website for the project is https://www.facebook.com/The.High.Nile.River.Pipes). 3. 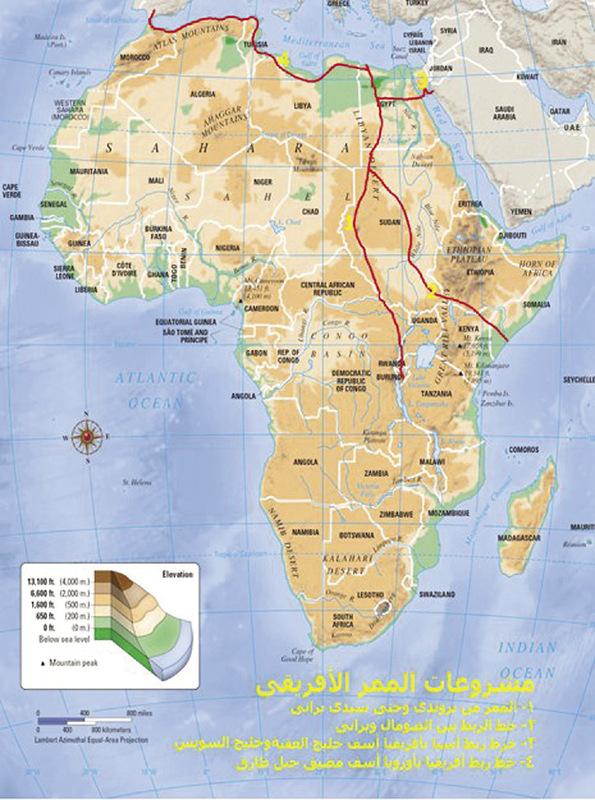 Africa Pass: This project, proposed by Egyptian engineer Aiman Rsheed, has the advantage of being a regional and transcontinental infrastructure project connecting Egypt to Central and East Africa, and the Mediterranean, through a high-speed railway system, and also bringing water to the Western Desert of Egypt from the African Great Lakes region and eastern Congo through a canal (see footnote 3). 3. Creating a national credit system: To avoid the trap of monetarist thinking, which implies that without money at hand, nothing is possible to build or achieve, it should be made clear what a Hamiltonian credit system means, and how that system was the keystone upon which the U.S was built as a modern, powerful economy. The Hamiltonian system implies that the nation and its government reassert their national sovereignty through an independent credit system, and that the purpose of the government and the economic system is to develop the land and the people, and that a financial system is established to reflect that intention. Therefore, the declaration of the intention is primary. Determining what steps to take to realize that intention in real physical-economic terms is step two. And finally comes the question of financing. But all three steps must be clarified in the Declaration of the government. While it is true that the government of Egypt is suffering a large budget deficit, and that Egypt is one of the most indebted nations in the region (about 1.2 trillion Egyptian pounds or about US$500 billion in domestic debt, and US$33 billion in foreign debt in 2013), the Egyptian nation is not bankrupt. By declaring its intention to unchain itself from the current economic conditions, Egypt will be able to domestically and externally make itself creditworthy. It is important to remember that the true capital of Egypt is its people, the millions of well-educated youth, its natural resources, its strategic location, its history and national character. What has been missing is a vision of the future, which can be provided in an appropriate Declaration of Economic Independence. Even in simple monetary terms, Egypt has internal capital in both dollar and national currency, deposited in various savings and investment accounts in the country that surpasses any IMF, Saudi, or Qatari loans by orders of magnitude. The problem is that that money is invested in investment banking activities, both in Egypt and on international markets, that add almost nothing to the net physical productivity of the Egyptian economy. In the best case, that money is not invested at all. The Egyptian Finance Ministry announced in March 2013 that Egyptians have deposited US$33 billion in various bank and savings accounts. An even greater amount is suspected of having been converted to dollar or other foreign currency outside the banking system, for fear of political upheavals and chaos, which have depreciated the Egyptian currency dramatically in the past two years. All financial assets in the nation have to be regulated to ensure that these assets are channeled toward investments in productive economic activities, rather than pure speculation, for example. They can also be encouraged to be part of the national credit mechanism to finance the reconstruction of the country. If the Egyptian government decides to launch the reconstruction program, it would have to establish a National Bank for Reconstruction and Development. Private capital can subscribe to this institution, which will be backed and guaranteed by the state. However, the principal matter is that the government, as a representative of the present and future interest of the people, use its power to create its own credit through the Treasury and the central bank, not merely to fill the gaps in its own current budget, but as allocations to the national reconstruction plans. A sovereign nation’s government has the right to become indebted in order to secure the future of the nation by increasing the productivity of labor and raising of living standards, and ensuring that the debt incurred this way will be redeemed in due time. The credit generated through the Reconstruction and Development Bank will be channeled through government corporations and commercial banks to corporations that are involved in the specific projects. As for the needed foreign capital goods, they will also be financed through bilateral mercantile long-term credit and trade agreements, or export guarantees by the exporter nations, which themselves are in need of markets and opportunities for investments. The key to ensuring both domestic and foreign confidence, is that the leaders of the nation of Egypt have a clear vision of the future and a steadfast determination to alleviate the living conditions of the people, and to make the country a major contributor to prosperity in the region and the world, in a concrete physical economic sense. 1. See background reports by the author: “It Is Not Just an Egyptian Crisis,” EIR, Feb. 18, 2011; “The Myth of Overpopulation in Egypt,” EIR, Feb. 18, 2011. 2. See “Pan-Islamism Is the Death of the Nation!” EIR, July 13, 2012. 3. See “What Europe Can Learn from Argentina,” EIR Special Report: Emergency Program for an ‘Economic Miracle’ in Southern Europe, the Mediterranean Region, and Africa, June, 2012. 4. See “Farouk El-Baz, Ph.D.: Geologist Proposes 1,000 Wells for Darfur; Use Science To Serve Mankind,” EIR, Sept. 14, 2007. There Is Life After the Euro! 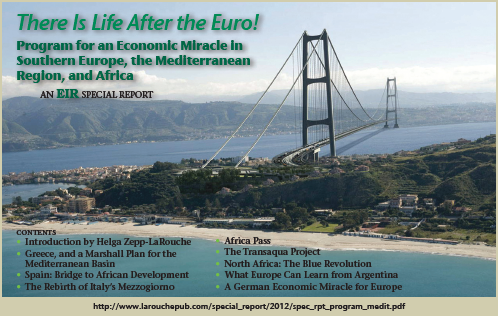 An Economic Miracle For Southern Europe And the Mediterranean!